It’s the longest and most mundane symposium ever! Three years ago John S wrote about his experiences watching the Malibu Sands arc of Saved by the Bell. 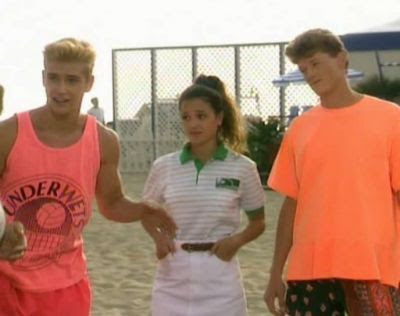 This summer, I watched the Malibu Sands arc of Saved by the Bell—mainly because I had just finished the first season of Game of Thrones and needed what a personal trainer might call a cool-down period. Consider this setting the record straight. —The issue to be raising isn’t over volleyball as a spectator sport. Clearly, Top Gun proved you wrong there. The issue is the sustainability of a beach club dynasty with an ever-changing roster of volleyball players. Just how can North Shore—the Valley of the beach, amirite?—continue dominating Malibu Sands for a decade when the players on its volleyball team (i.e. staff members at the club) presumably change each year? Now I know what you’re thinking: that I’m essentially describing major college sports, which obviously have dominant and doormat programs. But North Shore doesn’t have a coach; that much is obvious. Malibu Sands’ is Kelly. What we’re led to conclude, then, is that North Shore’s owner actively recruits excellent volleyball players to work at his club over the summer—likely costing himself hundreds of dollars in workplace efficiency—simply to beat Leon Carosi in a bet.